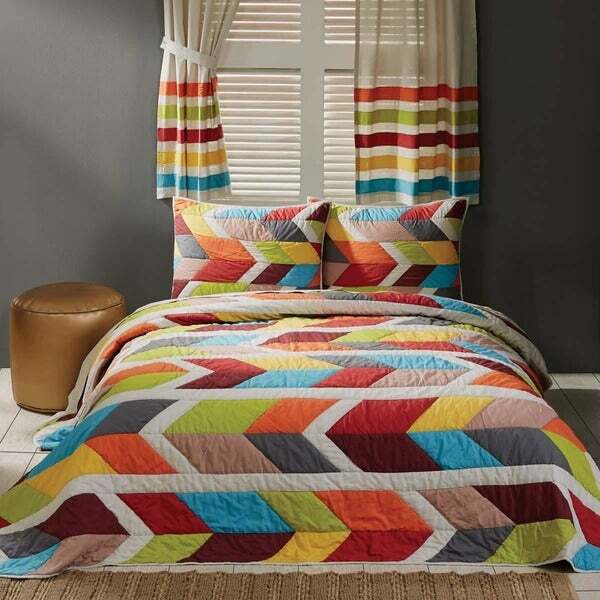 The Rowan King set showcases a fun and colorful modern arrow design in turquoise, blue topaz, carnelian, rich red and warm earth tone brown fabrics offset with the subtle texture of natural shade cotton flax. Includes two luxury shams with three topaz blue tie-closures on reverse. This quilt set is just beautiful. My teenage son wanted something bright & crazy for his room, and this fits the bill. This quilt is very well-constructed of cotton fabrics, and it is truly a pieced patchwork quilt, all of which account for the higher price tag, but this set is worth the money. I ordered the king size to fit a queen bed because I like plenty of overhang on the sides. After turning the quilt sideways (making the pattern run top-to-bottom), it fits very nicely. So colorful! Great quality! Love it! Colors are muted but still so pretty. My husband likes it because it's not too feminine. Great quality cotton. I love this quilt set. The colors are perfectly earth toned. It is great for the summer months, and the colors really brighten up my room. I get compliments by everyone who has seen it. Bought this for my sons room and the colors are great. More muted colors, so it’s not real busy looking. And my kids don’t really like to sleep with anything thick, so I love that this quilt is thin, but still stitched nicely, and is good quality. I’ve been happy with this purchase so far. And I have bought many many quilts from Overstock over the years. A beautiful quilt! Casual with bold colors! Love the colors in this set, but the online photo makes the quilt look much fluffier and drapier than it is in reality. It also has a permanently wrinkled look to it that I can neither wash and dry nor iron out. It’s a shame because the colors really are neat, and my five year old son loves the look of them...but I don’t think I would purchase again or recommend. I love this set. I should mention that the lightest color is a light grey, not white, but it is well made and looks super on our bed. Brightens up the whole room! Perfect for my guest bedroom. It coordinates perfectly with my curtains and area rugs. good quality, but unfortunately, it looks cheap ..
"Where can I find and purchase the curtains that make this quilt?" Unfortunately the curtains are not available. "Where can I find the curtains for this Rowan quilt set?" Unfortunately, we do not currently offer the matching curtains. "I need the Lux King, but do not see it as an option. Is Lux King available?" "Are the shams for king size pillows or standard?" "What are the ties for?" "Are the curtains in this picture available as well?"